Welcome To Pre-K C ! Hi, my name is Ms. Shakima Renee and I am the PreK-C teacher! 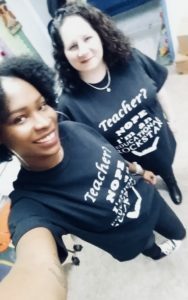 This is my third year teaching at Notre Dame Catholic Academy of Ridgewood and I am really excited to be working with Mrs. Nelida Santos again this year. The children can address us as Ms. Renee and Mrs. Santos, we are both really happy about getting to know your little one this year, and watching them explore and grow. I can be contacted via ClassDojo and by email at Shakima.Renee@notredamecatholicacademy.net . I will be checking the ClassDojo app periodically throughout the day, however, I will not be responding to messages after 4:30pm. Approaches to Learning- How children become involved in learning and acquiring knowledge. Physical Development and Health- Children’s physical health and ability to engage in daily activities. Social and Emotional Development- The emotional competence and ability to form positive relationships that give meaning to children’s experiences in the home, school, and larger community. Communication, Language, and Literacy- How children understand, create, and communicate meaning. Cognition and Knowledge of the World- What children need to know and understand about their world and how they apply what they know. This domain is a direct reflection of the content competencies and knowledge of the Common Core Learning Standards. Now that we have introduced the children and families to the program with the first unit, we will continue our journey of exploration and learning with an exciting topic focused on how we use our five sense to explore, investigate, and understand ourselves and our world. Children naturally explore the world around them through their senses. In this unit we encourage support cognitive and language development by encouraging children to observe things in their immediate environment and begin to describe them in detail. In this unit there is a focus on developing the Physical Development and Health Skills described in Domain 2 of the PKFCC. Throughout the unit, children will use their senses to assist and guide learning. Children will demonstrate increasing awareness and understanding of safety rules through discussions about how we use each sense to make judgements about safe situations or objects. Throughout the unit, there are activities and discussions about how life might be different for people who have disabilities that affect their senses. There are children’s books that introduce different disabilities and explain how people with disabilities might interact with the world differently. Week 2 was introduced asking the question “How do we use our sense of hearing?” I encouraged the children to pay attention to sounds they heard on their way to school. We also discussed sounds they would hear near their homes and animal sounds. I played animal sounds during circle time and the children were able to identify the animals by name. 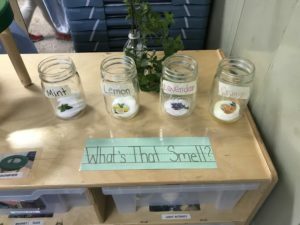 Week 3 was introduced by asking “How do we use our sense of taste?” and “How do we use our sense of smell?” We used labeled jars and assorted scents to make smelling jars. Children are encouraged to go over to the science center to smell the jars and try to identify the different scents. Taking turns and exploring the scent jars. Week 4 was introduced by asking the question “How do we use our sense of touch?”We took advantage of the Halloween season and made a Jaack-O-Lantern. While cutting the pumpkin open, we allowed the children to put their hands in a bowl and feel the pumpkin guts. I went around asking them to describe how it felt. During the pre-K year, children develop a concept and awareness of themselves as unique individuals. 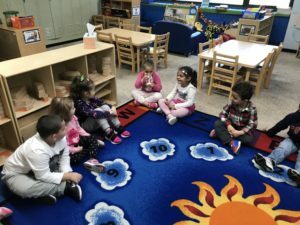 A strong sense of self supports children’s success in pre-K and lays the groundwork for realizing their potential throughout their school and life experiences. Unit activities such as self-portraits and like/dislike activities invite children to think about and express their ideas about who they are. Throughout the unit there are also opportunities for children to explore the attributes of their names. All About Us is designed to support and embrace the diverse populations of New City City Pre-K’s for All program and help children develop the positive self-concept and confidence to take on new tasks, think critically, remain persistent in the face of challenges, pursue interests and realize their potential as individuals as well as members of various communities. It is an opportunity to celebrate each an every member of the class both inside and out and set a tone of acceptance. ked parents to help their children create a self portrait. When all of the projects were completed we asked each child to write their name as best as possible and displayed each project in the hallway with their names written next to them. We played the game “Who Am Eye?” where we had pictures of the children’s eyes up in the Science Center, the pictures were available for the children to go over and play the game freely while in that center. We also discussed our fingerprint as something that made us important and unique. We put all of the children’s fingerprints on papers and hung them in the Science Center, we put out the magnifying glasses and encouraged the children to notice the difference between their prints and their friends. Week two we asked the question “What feelings do I have and why?” Children were introduced to an interactive feeings chart. They are able to match how they are feeling from an aray of labeled pictures. The chart has become part of the morning routine but is also available for children to access throughout the day as desired. Week three was introduced by asking the question “What makes my class important and unique?” We discussed what jobs are, why they are important and different types of jobs. After discussing the importance of jobs in the classroom we introduced the job chart. The job chart includes the operational need of the classroom. Week four was introduced by asking the question “What makes my family important and unique?” Children were encouraged to bring in pictures of their family members that were hung up in the classroom. We discussed who lived in their home and also different features that made them unique from their friends in the class. In Unit 4, children move from inquiring and thinking critically about themselves, their classmates and their family to the spaces that those people inhabit. This unit is designed to reflect the diverse places where people live in neighborhoods across New York City. There are opportunities throughout the unit for you to tailor discussions and activities to reflect the children and communities you serve. 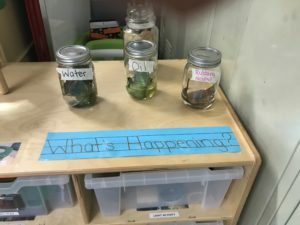 Additionally, in this unit children inquire and learn about the homes of animals, both pets living in homes with the children and those animals that create their own homes. This unit is designed to reflect the diverse places where people live in neighborhoods across New York City. There are opportunities throughout the unit to tailor discussions and activities to reflect the children and community they live in. Week one was introduced by asking the question “Where do I live? Where do my family members live?” Together, we read about different kinds of homes, including apartments, houses, etc. and discuss where different members of their families live. Week two was introduced by asking the question “Where do people and animals live?” After children consider the different kinds of homes in which they and the people they know live, they will start to consider animals and investigate a more abstract concept: animal homes. Week three was introduce by asking the question “What types of homes do the people in my city (NYC) live in? 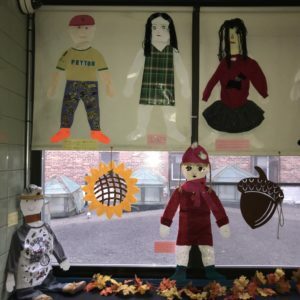 In this unit, children will develop a concept and awareness of the diversity of living environments and explore how New Yorkers live in many types of homes and buildings. Week four was introduced by asking the question “How do people and animals make homes?” Through this structure we mirror the process by which young children explore and understand the world; starting with themselves then moving outwards and from concrete to abstract. The children were able to build their own houses, using recycled milk cartons, paint and assorted shapes. 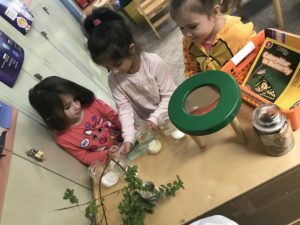 In this unit children will more from inquiring and thinking critically about the places where animals and people live to exploring how people move from place to place using vehicles and other methods of transportation. 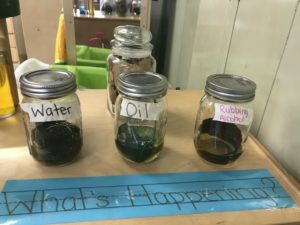 This unit provides opportunities for children to observe objects and phenomena in their environment with increasing complexity through hands-on activities in the classroom and in the community. Children will also have the opportunity to deepen their understanding of a major part of New York City life across all five boroughs. The full diversity of our city is reflected in this unit through the examination of trains, boats, cars, airplanes, buses, specialty vehicles, and more. In week two, we asked the question “How are various modes of transportation similar and different?” Children began to think about what made different kinds of transportation similar and different. We made a chart comparing and contrasting the attributes of different modes of transportation. Week three was introduced by asking “Who operated the vehicles in my community?” In this week children observe and explore vehicle operators such as bus drivers, conductors, taxi drivers, pilots, fire fighters, police officers, Emergency Medical Technicians (EMTs) and other community helpers. During this week we got a chance to learn about fire safety when fireman Nieves came and visited the school.